Below, please find schematics for things I have built in Minecraft that I’d like to share. The schematics were exported from a Flatworld map using MCEdit. I don’t want to end up doing a lot of support for Minecraft or MCEdit, so these schematics are offered as is. I can guarantee that they are virus free. They are also compressed, so you’ll need to uncompress them before using them. Beyond that you’ll need to check MSCEdit’s documentation for instructions on how to get them into your game if you’d like to use them. 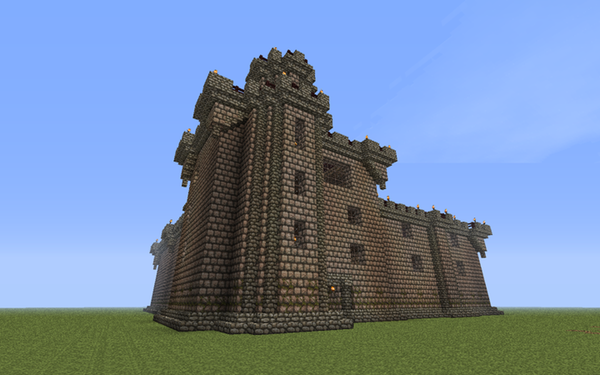 This is my attempt at recreating the famous Doune Castle in Scotland. This was the Castle used in the ‘Your mother was a hamster,’ scene in Monty Python’s Quest for the Holy Grail. The interior is not furnished at all, but includes several floors and many large rooms, a massive courtyard, and a well. 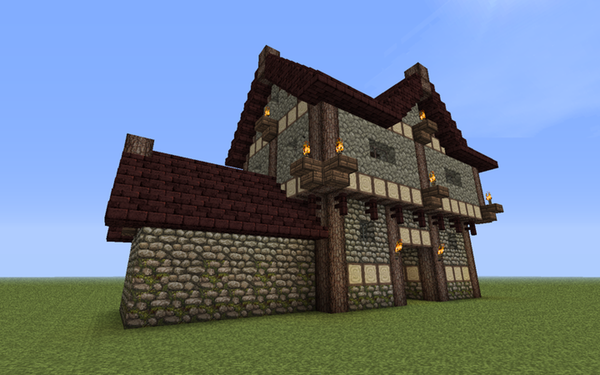 This is my attempt at recreating the gate house of Stokesay Castle in southern Shropshire, England. It’s built using stone and beam, but I did not go full Tudor with the choice of materials. The interior has three floors, not including the guardroom on the left. 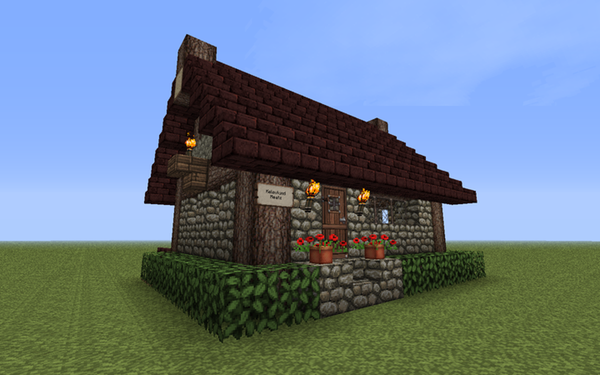 The Public House for a Nordic themed village I built. Stone and Beam construction with gabled roofs. The interior is decorated with a couple of tables and a bar. It follows the blueprints outlined on MineCraftWiki.com for Village Building Construction. 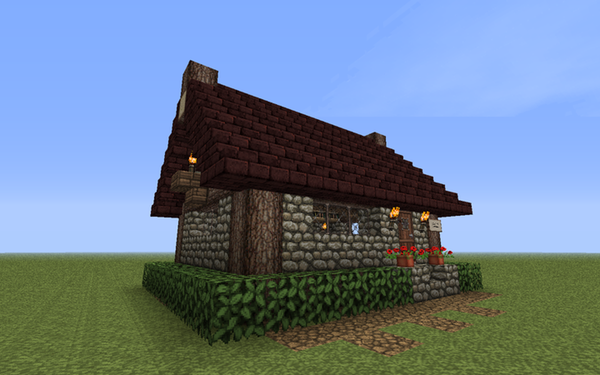 This is the Blacksmith for a Nordic themed village I built. Stone and Beam construction with gabled roofs. The interior is furnished with a couple of tables, two forges and a chest. It follows the blueprints outlined on MineCraftWiki.com for Village Building Construction. This is the Library for a Nordic themed village I built. Stone and Beam construction with gabled roofs. The interior is furnished with a couple of tables, a crafting table, and several bookcases. It follows the blueprints outlined on MineCraftWiki.com for Village Building Construction. 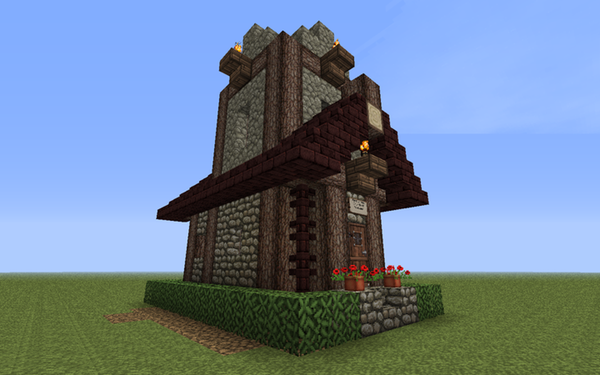 This is the Butcher for a Nordic themed village I built. Stone and Beam construction with gabled roofs. The interior is furnished with a couple of tables, and a counter, with an animal pen out the back door. 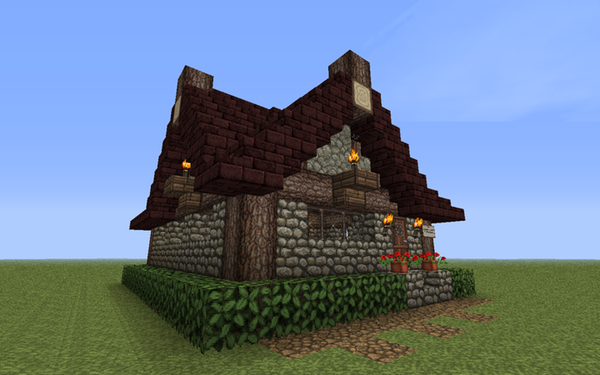 It follows the blueprints outlined on MineCraftWiki.com for Village Building Construction. This is the Church for a Nordic themed village I built. Stone and Beam construction with gabled roofs. The interior is unfurnished. It follows the blueprints outlined on MineCraftWiki.com for Village Building Construction. 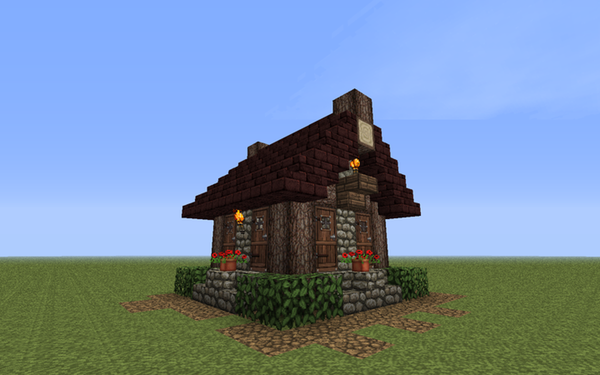 This is the Villager House for a Nordic themed village I built. Stone and Beam construction with gabled roofs. The interior is unfurnished. It is built to maximized Villager spawning. It follows the blueprints outlined on MineCraftWiki.com for Village Building Construction. I would love to do this, but I cannot get anything to open. The schematics were created using MCEdit: http://www.mcedit.net. You need MCEdit in order to open and import the schematics. As mentioned in the post, you also need to uncompress the files first. I downloaded Doune castle map on my tablet, I exstracted file in minecraft PE worlds file, but whenI entry the game, map wasn’t in worlds list. Why? I created the files using MCEdit for the PC. I’m not sure how that would work with a tablet version. Sorry. On which version is available map of castle? And must I extract archive? The maps should work with any version of Minecraft, but yes you will need to extract the archive, and you’ll also need to use MCEdit to import them into your game. As I mentioned in the article, I don’t really offer support for the maps. They are offered as is. LOL Sure, go for it. I was inspired by other work I saw, so feel free to use them as you like. No payment needed. Enjoy the game of Uno! Thank you! So how would you like to be credited? “Tenten at tententacles.com” ok? What texture pack did you use? It’s honestly been so long, I don’t remember, but I think it was just the default pack.